HALIFAX -- A Nova Scotia mother is sharing heartbreaking details about her family's struggles caring for their nine-year-old son with severe autism who suffers from violently aggressive fits. "We're living in a nightmare," Carly Sutherland, who is using her story to prod governments to do more for families like hers, said Monday. "I can't hug him. I can't touch him. I listen to him scream upstairs and punch holes in the wall all day." Sutherland held a press conference at the Nova Scotia legislature in November asking the government to take action, and has now followed up with a letter to Premier Stephen McNeil and other ministers outlining what her life has been like since Callum came home from the IWK Children's Hospital on Dec. 4. The letter said Callum attacks anyone who comes near him. "My hands and arms are shredded from scratches and bites. He just punched me in the nose this morning," she said in the letter, sent Monday. "He developed a phobia of toilets at the hospital so we now spend multiple hours a day cleaning up feces." While at the IWK, Callum was confined to an isolated unit for safety reasons because there was no appropriate therapy available. He was too violent to participate in the unit's school or recreational therapy, and was not verbal enough to access counselling services. Sutherland said Callum came home from the hospital mostly unchanged from when he was admitted on Oct. 19. "Unfortunately, the IWK does not have the resources or expertise to support children with autism in crisis," she said. "They don't even have a complex care coordinator right now. It's an unfilled position. So we were left with that role -- to scramble to get supports." She said she's currently unable to have any interaction with her son if a support person is not present, and it could take years before a suitable placement in a Halifax-area group home becomes available. "We have come to terms with the fact that this situation at home, no matter how much we love Callum, is not sustainable for any caregiver," she said in her letter. "I'm not sure how much longer we can manage." Sutherland said her family spent more than $5,700 on support people and behavioural intervention for Callum between Dec. 4 and Dec. 31. The family is now receiving $3,400 in respite funding through an income-based provincial program, and family and friends have also fundraised $14,000. Sutherland said while she's appreciative of the financial support, what's really required are more government-provided resources and services, noting that her family is left to hire, train, and schedule staff to be in her home to support Callum. She said the family is currently consulting with the IWK on a behaviour plan for Callum. Sutherland -- who has training in special education and crisis intervention -- then teaches the plan to support workers with the help of Autism Nova Scotia. "It's not a big stretch for me, but it's still hard, and I'm thinking, 'What about people who don't have this skill set? What do they do?' The government just says, 'Here's some money. Find and train people.' But that's insane," said Sutherland. 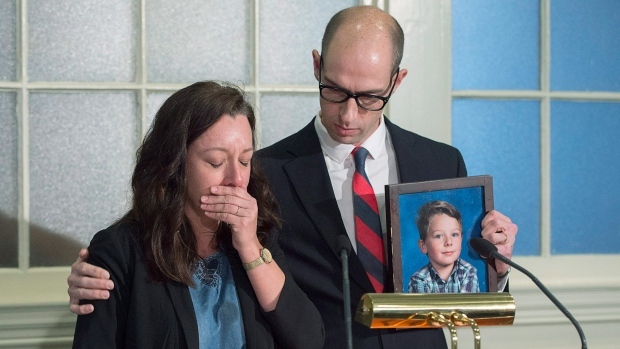 Sutherland said Callum had done well in the province's Early Intensive Behavioural Intervention program, but that program is only available to children six and under. "It's crazy because kids still have autism after they're six," she said, adding that Callum has made some progress, but is not ready to return to school. "We've been on our own to figure out what to do." In an email statement, Nova Scotia's Community Services Department said "officials have been in touch with the family and have invited Ms. Sutherland to meet to discuss the ideas she raises in her letter." Nova Scotia's Health Department is spending about $15.7 million on autism services in the province this fiscal year. The figure includes $300,000 for Autism Nova Scotia to expand resource centres, particularly in rural areas. There is also $500,000 for an early intervention pilot program to help parents before their children go into the early intervention program. Sutherland said her family's situation is not unique, and she planned on attending a town hall with Prime Minister Justin Trudeau on Tuesday in the Halifax area to push for a national autism strategy. The Senate has called for such a plan, and issued a report titled "Pay Now or Pay Later: Autism Families in Crisis" a decade ago calling for more assistance. Sutherland, who now suffers from depression, said the only thing that has kept her family going is the fact that Callum has a six-year-old brother. "We just have to keep going. You have to put a smile on your face and put cookies out for Santa and get excited about things. That's the only reason we're functioning, because we have to do it for him," she said.